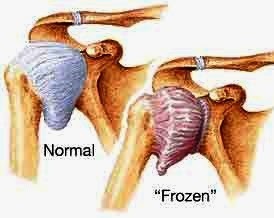 A 'frozen shoulder' or adhesive capsulitis in medical terminology is a problem affecting the shoulder joint. It is the result of scar tissue being formed in the joint, with thickening and shrinkage of the capsule which surrounds it. Any injury to the shoulder may trigger a frozen shoulder, but there are also certain medical conditions which may make it more likely. These include diabetes, arthritis or after certain types of surgery including breast, neck and chest surgery. If the shoulder joint is kept very still for long periods of time - such as when the arm is in a full-length plaster - there is also a risk of a frozen shoulder developing. These are simple - a shoulder which is either immobile or very difficult to move, and pain in it when movement is attempted. Sufferers may notice they are unable to put their arm behind their back (e.g. to fasten a bra strap) or raise their arm in front or to one side of them (e.g. to reach for something). Not only is it painful when they try to move it themselves but if someone else tries to move their arm too, such as a doctor, then this is painful as well. There may be a small amount of movement of the arm when it is hanging by the side of the body, but pain begins when it is raised to the side. This usually prevents any further movement, but if the person is able to move their arm through the pain they often find that they become pain-free again when their arm is nearly vertical - the so-called 'painful arc' of movement. The diagnosis is usually apparent from the history and the examination. There is often a great deal of reluctance and hesitancy to use the arm on the part of the patient, being apprehensive about anyone else moving it for them. Blood tests may be taken to rule out any other possible causes of inflammation around the shoulder, and simple X-rays of the shoulder joint can confirm or deny the presence of arthritis or wear and tear around it. Occasionally, a test called arthrography is needed if the condition is severe and fails to respond to treatment. In this test, a harmless dye which shows up on X-rays is injected into the shoulder joint, and an X-ray taken afterwards. A frozen shoulder shows up as a shrunken and inflamed shoulder capsule lining the joint. The simplest treatment is usually a combination of NSAIDs (non-steroidal anti-inflammatory drugs, which reduce the pain and inflammation around the joint) and shoulder exercises or physiotherapy. The types of physiotherapy which can be used include ultrasound, regular exercises and electrical stimulation. Some patients find cold compresses or ice packs applied to the shoulder helpful in reducing their symptoms. A bag of crushed ice (or frozen peas!) wrapped in a towel is placed on the painful part of the shoulder and strapped into place with an elastic bandage. This should not be so cold that it becomes painful but should be tolerable for about half an hour. After this time it is removed, but this can be repeated every 4-6 hours until the symptoms have eased. There may be occasions when these simple treatments do not cure the frozen shoulder. In such cases, an injection of hydrocortisone is injected into the joint. This is often given with a local anaesthetic at the same time, and fluid can also be drawn off the joint for inspection in a laboratory if this is felt to be necessary to check for bacteria. Hydrocortisone has an anti-inflammatory effect and is longer lasting than NSAIDs. Should all these measures fail (fresistant frozen shoulders') then surgery is considered. Under general anaesthetic, a keyhole procedure is undertaken where an arthroscope is inserted into the shoulder, allowing the surgeon to release any scar tissue in the shoulder. This is usually accompanied by vigorous manipulation of the joint to release any other adhesions and free it up. This must always be followed by an intense programme of exercises for many weeks afterwards to prevent the shoulder stiffening up once more since it is only by keeping the shoulder joint supple that long-term benefits are obtained. Without fairly aggressive treatment, a frozen shoulder can lead to permanent shoulder problems, so it is always essential to seek help sooner rather than later. It is common for people to suffer repeated attacks of a frozen shoulder over many years, and in either shoulder joint. Extremely mild cases may resolve by themselves with analgesia and simple exercises, but most will need medical treatment of some description. • Seek medical advice sooner rather than later. • Always remember to warm up and warm down before and after exercise. • If you injure your shoulder playing sport, remember to use cold compresses on it as soon as possible. • If you are prone to recurring frozen shoulders, practice regular shoulder exercises even when you are symptom-free. 1. When did you first notice your symptoms? 2. What movements or activities are you unable to perform? 3. Do you remember injuring your shoulder recently? 4. Have you tried any painkillers or exercises yourself? 5. Have you had any similar symptoms before? 1. Do I have to change my sporting activities? 2. Should I have a supply of NSAIDs at home in case this happens again? 3. Would I need to see a specialist? 4. How many hydrocortisone injections am I allowed to have? 5. What are the possible side effects of anti-inflammatory drugs?